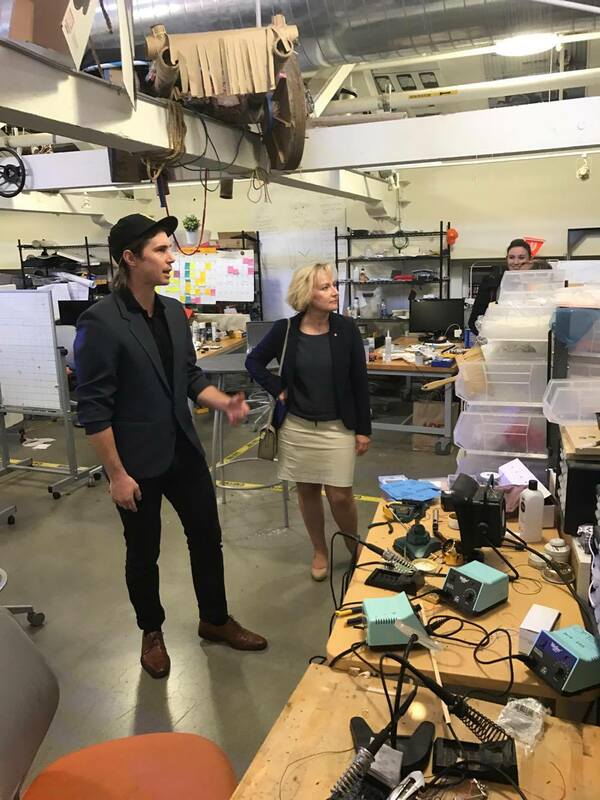 The Swedish Minister of Higher Education and Research, Helene Hellmark Knutsson with entourage, came to meet the BTH-affiliated team at Stanford Engineering’s d.School on Thursday to see them in action in their final push to bring their design project to completion in time for the Stanford Design EXPErience on June 8. 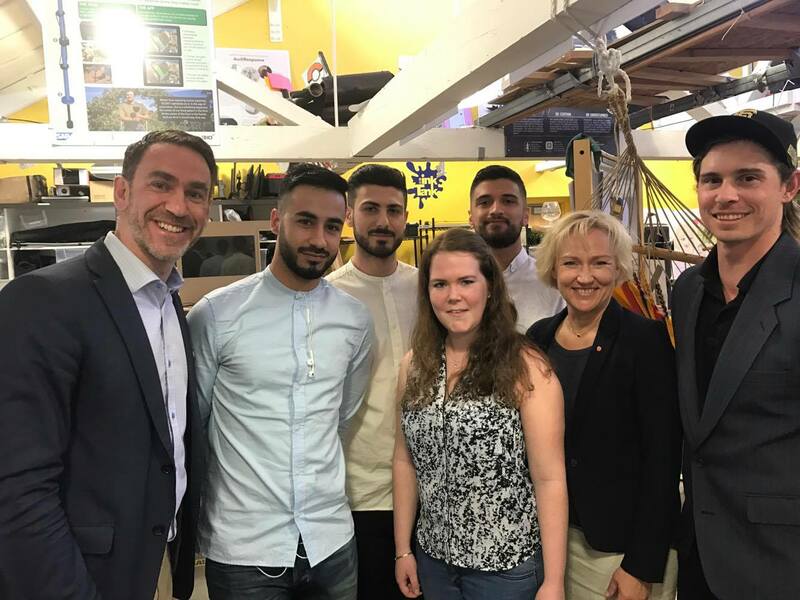 Henric Johnson (prorektor), students Noor Ameen, Kristian Elawad, Louise Karlsson and Hassan Safawizadeh. Minister Helene Hellmark Knutsson and BTH research assistant Ryan Ruvald. We met in one of the open design studios in Stanford d.school, ME310 loft, filled with whiteboards and standing-only tables that have become synonymous with the Design Thinking approach. After a short introduction to the two-decade long relationship between professors Tobias Larsson (then Luleå, now BTH Mechanical Engineering) and Larry Leifer (Mechanical Engineering, Center for Design Research), including our past five years of BTH and Stanford partnership projects with Volvo Construction Equipment as a supportive sponsor, we entered the loft to see the team in their natural habitat. Ryan Ruvald tells the story about the Stanford d.school and the BTH Mechanical Engineering collaboration with Stanford Design Division. Upon entering the loft it was clear the group was taken aback by the inspiring nature of seeing so many hands and minds busy crafting innovative solutions for the future to come. The environment of the loft itself added to the shock value, paper bikes hanging from the rafters, crafting materials strewn about in a state or organized chaos, prototypes on team tables in every state of completion running in direct contrast to the traditional Swedish tidiness. This is all part of the legendary ME310 Design Innovation course, running since 1969. 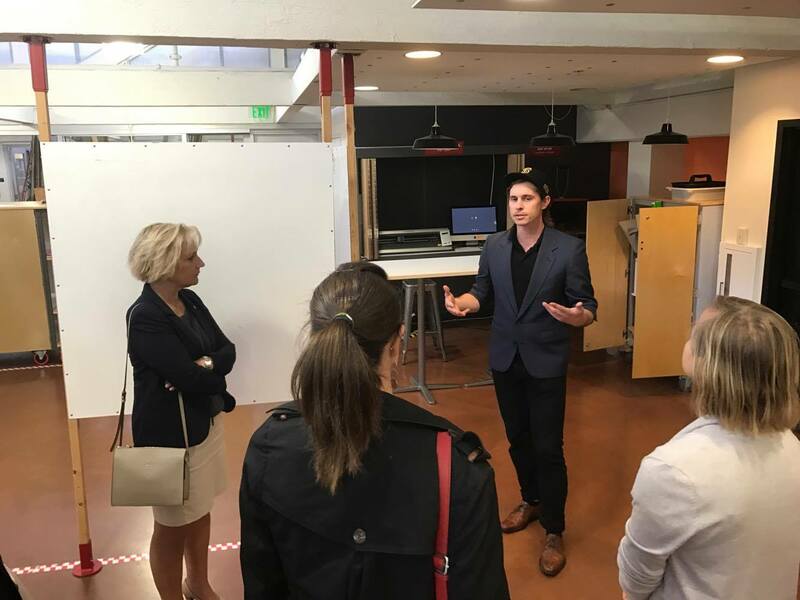 Minister of Higher Education and Research Helene Hallmark Knutsson tours the ME310 “Loft” design space. While the team explained their process Helene engaged them with comments conveying her understanding of the topic and encouragement for the globally collaborative nature of the work. With the Minister keeping to a tight schedule we took the opportunity to show the prototype from last year’s team as they exited the loft and bid the team a fond ‘hej då’.